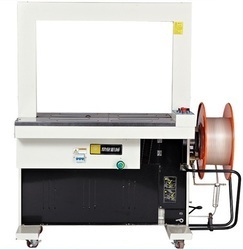 We are specialized in manufacturing Fully Automatic Strapping Machine to our highly valued clients which are made using ultimate raw substance to ensure caliber. This machine is manufactured using optimum quality raw material in accordance with the international standards. 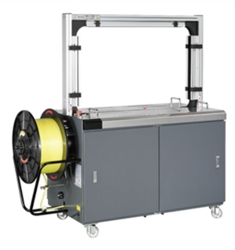 We offer very reliable and user-friendly fully auto-strapping machines. With easy strap loading & fully automated operations, our machines are easy to maintain. Offering reliable, speedy & ease of operation, we offer different models suitable for varied industrial packaging works. In addition, we provide custom designed products. BAM801A", The quality of our newly designed BAM801 model together with a drivan belt conveyor is difficult to match. With 50 strapping cycles per minute, BAM801A is fast and efficient. It is easy to improve your existing conveyor line with the high performance of BAM801A.